Lowdown: Examinations of the concept of privacy in an age when technology provides unprecedented tools for violating it. I was hesitant before going ahead to read David Brin’s The Transparent Society. 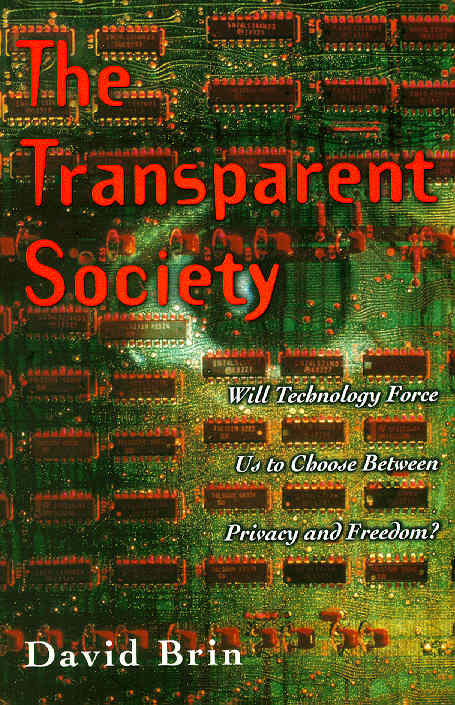 For a book dealing with the concept of privacy, particularly under the accelerated age of the Internet, this 1999 release was bound to be severely out of date. I did give it a go, though, and the introduction captivated me. The introduction is actually the story of the whole book that follows, the core theme without the meaty details. Essentially, Brin is stating the obvious: the way our society is heading, it is inevitable for there to be cameras under every fresh tree looking to see what we are doing (I suspect Brin is not referring to cameras explicitly but rather uses cameras as a metaphor for other surveillance measures introduced to society through the marvel of modern technology). If that is the case, and in many respects we can say it already is – particularly in the UK – then we have the choice of one of two types of societies to live by: either a big brother society where someone watches over everything we do, potentially without us even knowing about it; or a society where we have access to do the watching ourselves. In such a society as the latter we can tap on cameras to see if the streets are safe for us to go jogging; we can also watch the watchers and ensure their accountability. Now, which of these two societies would you want to live in? As I said, the rest of the book is detail. Brin goes on to draw lessons from history and science to analyze the concept of privacy from various angles at length. He always returns to the same conclusion, though. I particularly liked the way Brin projects from the past into the future, the way one would expect a veteran futurian to do; in this he reminded me of Charles Stross, another science fiction author that likes to discuss contemporary non fiction issues in the mirror of science fiction over at his blog. Looking at things from this angle certainly reveals a lot, such as the relative young age of the whole concept of privacy: in the not so distant past, as Brin points out, entire families sharing a room could not even imagine the privacy we now take for granted. That initial spark that drove me enthusiastically through The Transparent Society’s early stages soon faded, though. The number one reason is the laborious nature of the read: The Transparent Society is a rather hefty book, much longer than it should have been by my reckoning. There is much repetition, and the whole affair feels too disjointed to support smooth reading. For example, ideas are often presented but then dismissed along the lines of “we will further explore this concept in chapter X”. If I had a dollar for every such dismissal I would have been able to buy several copies of The Transparent Society for my friends. As it is, I felt I was reading a book that was interesting and brimming with ideas but where if I was stopped and asked what I recall of the previous chapter I would find myself dumbfounded. Readability matters, and The Transparent Society is not as transparent as it should have been; it’s rather tedious. The second problem I had with The Transparent Society was with me. I found myself often disagreeing with Brin and his conclusions. Disagreements are fine; as long as they offer well constructed arguments, I tend to learn more from those I disagree with than I do from those I agree with, and Brin’s are certainly well constructed. The problem, though, is that he was unable to convince me. For example, I often found him rather naïve – as with his suggestion that we monitor the monitors. Can we, really, do so? Let’s have a look at Facebook as a fine example. It asks us to strip ourselves naked on its behalf, but on the other hand its founder is actively avoiding doing the same. What tools then do we have to implement Brin’s suggestion, then, and enforce Zuckerberg to be as transparent as he expects his users to be? We don’t. Which brings me to my third and final gripe with The Transparent Society. It may be full of vision, but it certainly is outdated. Brin cannot be blamed: his book came before Napster, September 11, Facebook, Wikileaks, Trapwire, ACTA, The Pirate Bay, and everything else that has transpired during the last decade. Quite a lot has happened since, and many of the speculations Brin makes have now been replaced by truths we take for granted. It is for these reasons that I decided to abandon The Transparent Society exactly half way through. If one is looking to be inspired by ideas relating to privacy then one would find many a joy with this book. However, I am of the opinion that at this day and age The Transparent Society has been surpassed. Better books are out there for dealing with the concept of privacy and its close relationships – IP, copyrights, etc. Some of them are even much nicer to read! I therefore give The Transparent Society 2 out of 5 stars, but I have to qualify my rating by repeating the fact I only read it half way through. Reading the book felt like a rollercoaster: wonderful ideas are introduced, then slow and often annoying digestion follows. After the third time the thought of leaving the book alone occurred to me I realized it might be the right thing to do, but that realization is highly personal. On one hand, since letting this one off I finished two other books (albeit very short ones), which points at the problems that come up when one is reading a book one finds less than exciting. On the other hand, it is clear I'm going through a period of Long Book Phobia. Books have to offer me very good reasons for going north of 4000 kindle units; 6000s are accepted very conditionally; and 8000s plus are not accepted unless written by a Dawkins or a Scalzi grade author. My point: you might read this book and think it's wonderful.